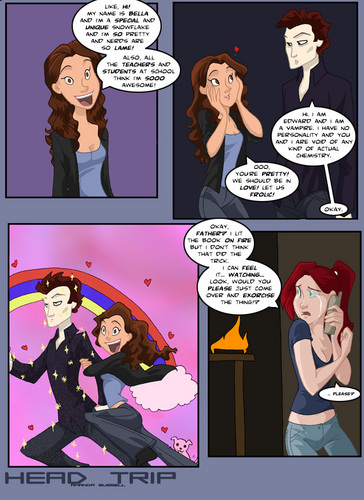 Twilight In A Nutshell (if 你 have no sense of humor, DON'T LOOK). This. Is. BRILLIANT. XD. HD Wallpaper and background images in the 值得一读的书 club tagged: books twilight funny cartoon comic edward cullen bella swan frolic. This 值得一读的书 photo contains 动漫, 漫画书, 漫画, 卡通, and 漫画卡通. LMAO. I loathe Twilight and found this hilarious, I'd try and exercise the book too. Genius. Hey guys, if you liked this comic, check out my "Twilight in a Nutshell" video! I don't even get it?!?!?!?! For the people who don't get it...I don't get you. Anywat, hilarious! I loved their 'frolicing' and the book exorcism. Nice. haha i am a twilighter too but that doesn't mean i can't recognize funny!! I loved the whole book exorcism!!! Totally agree on the lack of Edward personality. Very frustrating when I tried to read the series. True . And funny . LOL!! LOOK AT EDWARDS FACE!! i must b really slow - i don't get it? help! yup, that's pretty much right! Was that nessie in the last box. And what the hell is on Bella's leg when they are 'frolicing'? haha, loved the frolic part, didn't get the last panel though. LOL!Btw,I'm a twilight fan and I still found this funny. look you are bozos. if you look at the series youll see the characters portray a much deeper characer tha you presume.dont be quick to judge.and where is jacob in this thing. Umm...it's called a "joke". As in, "not meant to be taken seriously". And I'm sorry, but a deep character develops, learns and grows from their experiences, and has a vivid personality and a good, gripping backstory. Edward and Bella have NONE of those things. People claim them to be deep characters, but they have nothing to show for it or back it up. It's an empty label; one that Mr. Sparklepants and his Twoo Wuv certainly don't deserve, IMO. I like Twilight, but I must say this is funny! I have already watched the video on YT. HILARIOUS! ''Like, hi! My name is Bella and I'm a special and unique snowflake...'' I couldn't stop laughing. And Edward's face makes me ROTFLOL. I mean... look at him! Heh. I don't like Twilight and I'm happy to see this picture here. this is excatly how i imagined Bella. LOL! Very funny . Not the biggest Twilight fan . Books are better than film.